The movie was great... INTENSE! 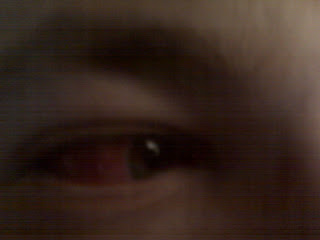 SO intense I got one of these..
Not sure if the movie had anything to do with it... but my eye looks disgusting! did ya have to do a close up?...sheesh that was def an attention getter. i've been thinking are you sure you weren't chewing your popcorn loud and got popped from the guy in front of you? he..he..pray your eye heals now in Jesus Name! Hey Ken I´ll be praying for your EYE ok!!! God´s in Control..